While modeling the think-aloud strategy "teachers verbalize aloud while reading a selection orally. Their verbalizations include describing things they're doing as they read to monitor their comprehension. The purpose of the think-aloud strategy is to model for students how skilled readers construct meaning from a text." (Farr,Connor, 2015). Think-alouds can be used before and during reading. They can also be used individually, with small groups, and in a whole group setting. Teachers need to model this strategy before letting students do it on their own or in small groups. When modeling, the students are able to answer the questions that the teacher is asking. Come up with questions to ask for students to use as a guide. Give the students many opportunities to practice this strategy before letting them do it on their own. "When teachers model strategy use (such as through think-alouds) and then provide appropriate scaffolding during practice sessions, students are more likely to become effective strategy users." (Ehevarria, Vogt, Short, 2015). 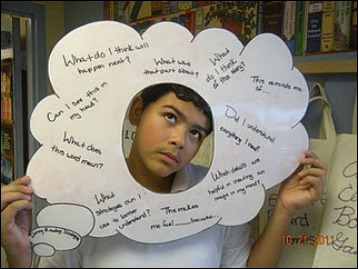 There are a variety of ways to embed the think-aloud strategy into the curriculum. According to Reading Rockets, there are three parts to the think-aloud strategy: modeling, coached practice, and reflection. Once these three components have been gone through extensively, the students will be ready to use the think-aloud strategy on their own. Using those three parts is a way of scaffolding our instruction for students and using a bottom-up approach. "There is no magic formula or set of steps which will make this method (or any other) successful. Success lies in how you use it – which means choosing appropriate texts, listening carefully to students, determining students' abilities, and adapting the method to your own students' needs and abilities." (Farr, Connor, 2015). "Learning strategies can transfer to new tasks." (Echevarria, Vogt, Short, 2015). Mathematics: When teaching a new math concept, the teacher can use think-aloud strategies to model what steps students should be taking. The teacher can talk about the questions and processes that need to go through a student's head as they solve the math problem. "Self-regulated learning emphasizes autonomy and control by the individual who monitors, directs, and regulates actions toward goals of information acquisition, expanding expertise, and self-improvement." (Echevarria, Vogt, Short, 2015). This is important because students will need to utilize the different strategies they have to complete the math problem. Science: Teachers can use the think-aloud process to discuss the scientific processes and experiments. When asking students to explore and evaluate, the teacher can model the thought processes and questions that go along with those tasks. This can be critical for students because they will be learning the framework for how to approach a posed science question. Reading: While doing an interactive read-aloud, the teacher should model the think-aloud strategy to show students what questions and thought processes need to happen when you read. This will show the students how to make connections, ask the right questions, and predict what will happen next. Social Studies: While discussing different cultures, places, and historical times, think-alouds can be a great strategy to help students delve deeper into their understanding. The students will use questions modeled by the teacher to help them further their comprehension. If they are reading their text book about a difficult topic, such as the Holocaust, they can use the think-aloud strategy to help them understand better. Two of the key statements that will help students in social studies is: "I was confused by.." or "I have to reread that part because". Why should we use think-alouds? Monitor their strategy use according to the purpose for reading the text" (Farr, Connor, 2015). Wayne Wright discusses the need for "using scaffolding, promoting higher order thinking skills, and teaching learning strategies." (Wright, 2015). We use think-alouds to help students realize what questions and statements skilled readers use to make sense of the text. This video models the think-aloud strategy. What kinds of questions does the lead teacher ask? How often is she asking for a response from the other two teachers? How often does she answer the questions herself? These three teachers are working on improving their instruction through the think-aloud strategy. They are practicing the strategy before trying to teach the strategy to their own students. This is an example of how to use the think-aloud strategy while explaining a math concept. She reiterates, "I am talking to myself. I am asking myself questions," to make sure that her students are fully understanding the think-aloud concept. This strategy will be helpful to students in the math classroom, because they can use it to talk through and visualize the math problem coming together. The teacher models beginning the problem with the end in mind. ​​Donna Coates - Think Aloud Math Problem Solving - LEaRN DVD5 SS6. (2012, July 31). Retrieved September 26, 2015. Farr, R., & Connor, J. (2015). Using Think-Alouds to Improve Reading Comprehension. Retrieved September 26, 2015. Think Aloud Strategy. (2012, December 27). Retrieved September 26, 2015. ​Think Aloud Strategy. (2015, June 25). Retrieved September 26, 2015. ​Wright, W. E. (2015). Foundations for teaching English language learners: Research, theory, policy, and practice. Philadelphia: Caslon Pub. I just thought of..." (Think Aloud Strategy, 2015). This activity was provided by Reading Rockets. This will be used during the "coached practice" part of teaching the strategy to students. "With a different text from the one you initially modeled, tell students you will be stopping occasionally as you read to ask them what they are thinking about. Tell them you will call on one of them and ask them, "What are you thinking about now?" (They should not have a copy of the text in front of them.) If, when a student shares his thoughts, the connection to the text is not clear, encourage the student to explain himself. (If students are having trouble with this task, focus in on one single strategy – for example, prediction.) Once you've finished reading the text, go back to your master list of strategies, discuss which ones the students used, and add to the list if new strategies come up. Repeat this activity another day, using a new text. If students have trouble, you may need to stop and model thinking aloud again for students. Next, insert write-in boxes into a new text. Explain to students that they will be doing exactly what they had been doing out loud, but this time they will be writing their thoughts in the boxes. When students are finished with the task, read the text, stopping to ask students to read what they have written in the boxes and to explain what made them think of what they wrote. Go back to your master strategy list and have the students talk about the strategies they used. Add to the list if possible. What strategies are you discovering students are not using, even when the text and the purpose for reading would seem to encourage those strategies? Focus in on 2 or 3 of those strategies. Find a text which lends itself to those 2 or 3 strategies. Assign a strategy to each of the different colored objects. Explain to students that, when they are presented with a colored object they are to use the strategy assigned to it. Read a text to them and stop at certain predetermined stop points. Hand a student one of the objects and encourage him to use the strategy associated with that color." (Farr, Connor, 2015).